This is the 6th post about our bathroom remodel. For more information about each step of this process, click here. It was time to install some new fixtures in the bath. We found an attractive light that replaces the dated and rusted bar light that was over our mirror previously. We picked up this light at Home Depot. This is one item we feel we overpaid for because it went on sale six weeks after our purchase for half the price. Because it was after their 30-day price guarantee period, they would not refund us the price difference. Although we understand their policy, it still annoys us to spend more than value for an item. 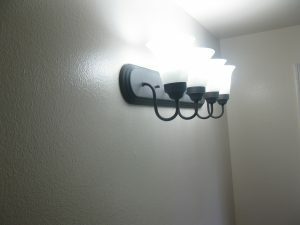 We chose to hang the light upside-down from how it is advertised on Home Depot’s site, because we prefer a more diffused light, rather than a direct light. The next items we installed were fixtures in the shower stall. We chose a slick, stainless steel handle, but it wouldn’t fit the attaching structure coming off our water pipes. Instead we bought a new version of the same acrylic ball design that was in the shower previously. It’s a dated style, but we didn’t feel like doing a big plumbing job just to put on a more modern-looking handle. 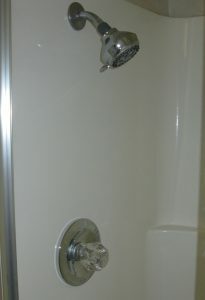 We also extended the arm of the shower head to get the water spray out farther in the double shower stall. 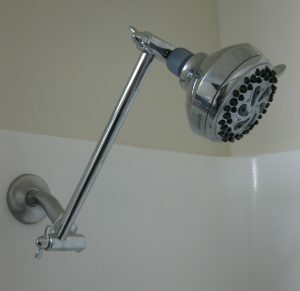 The current pipe from the wall aims downward and has always created an awkward spray for tall people in the shower. This new extended arm increases our shower spray to cover the whole stall and flexes to the spray demands of the different shower users. The arm was purchased through Amazon (click text to see item listing). The pictures below show the shower head with and without the extender arm. Our favorite fixture change in the bathroom has been the TOTO toilet. This is a super toilet — quick and complete flushes every time. We purchased the toilet (click text to see item listing) and a lid for $255 from Home Depot. 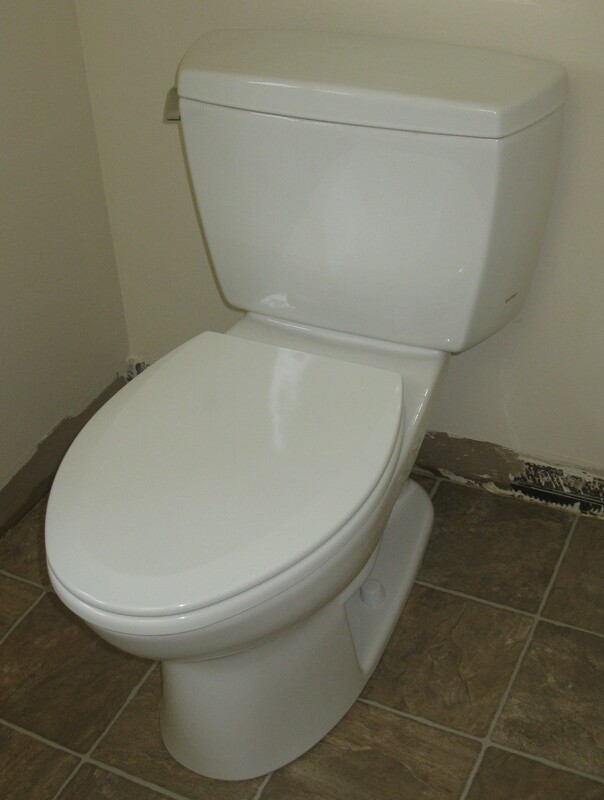 The picture below shows the toilet in place. (Note: The baseboards had not yet been installed). We had returned many of the basic bathroom functions to functionality, but we still needed a sink. You’ll see that installed in the next post.